This is so far one of favorite synth stuff you've posted. Although it's probably not rare enough (!) for this crew, Kevin Harrison's Cherry Red LP (esp. the intro "Trapezoidal, trapezoidal, trapezoidal..." loop might be of interest to some. better say not that expensive instead of rare,because even though i did not pay much money for Shark bait LP ,i was searching for it for about 8 years! Oh, Thanks a lot! I've been looking for at least the mp3's for a while, I just had pogo music from atomic shockwaves compilation... You got a pretty neat blog, keep going, and thanks for sharing. Cheers from Mexico. 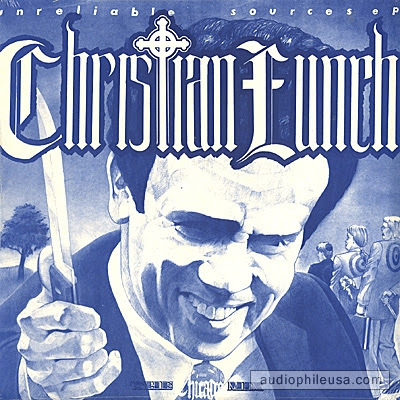 '80s vintage punktronic hothead Christian Lunch, of "LET THEM EAT JELLY BEANS" & "WITCHTRIALS" and other albums, has finally gotten his stuff up on the internet for the curious to check out. the unreliable sourced demo recordings have bee released on tunecore in a compilation called "FIGHTING THE SAME OLD WARS"
Did you want me to pull down the link for this post then due to that?